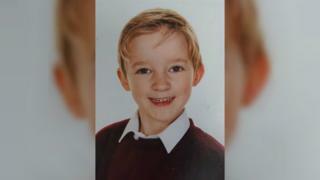 Image caption Riley Jake Jackson died in hospital from "fire related burns and carbon monoxide toxicity"
A six-year-old boy died after a bedside lamp fell over next to where he was sleeping and caused a house fire, an inquest has heard. Derby Coroners' Court was told the heat from a halogen bulb caused the lamp shade to catch fire on 26 October. Riley Jake Jackson died in hospital from "fire related burns and carbon monoxide toxicity" after being rescued from the house in Ilkeston, Derbyshire. Coroner Robert Hunter recorded a conclusion of accidental death. Giving evidence to the inquest, Riley's mother, Cheryl Bradley, said she heard the fire alarm go off upstairs at about 22:30 and "couldn't describe the fear". She ran upstairs, found the bedroom door shut and could feel the heat of the flames. Despite numerous attempts, she could not open the door and then ran in to the street and screamed "please help my son". A neighbour ran in to the house and tried to open the bedroom door, but also could not. Three fire crews were sent to the scene and two firefighters wearing breathing apparatus took Riley out of the bedroom. Ms Bradley said Riley was "high-spirited, a joy to be around, very loving, had a thirst for knowledge, a huge character and a very happy little boy". Dr Hunter said there was "no other possible conclusion than that of accidental death". "Riley's death can only be described as a tragic accident," he said. Shortly after Riley's death his mother received messages on social media, which caused extra distress to the family. The coroner said the messages showed a "disturbing lack of compassion for a mother who has lost her darling little boy".